Amadablam is known as a one of the world's most beautiful peak, alongside the Matterhorn and KhanTengri. The experienced mountaineer will find the South East Ridge, at its easiest.It offers good steep mixed climbing in the most stunning and exposed situations. Fixed lines will be used to ease our ascent for most of its length. The ascent to Camp One at 5800m is quite straight forward from which point it gradually steepens as we move onto the rocky south-west ridge. The final approach to the summit is on snow slopes up to 45 degrees. 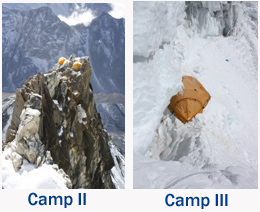 Day 01 : Meet our team 4 PM at Base Camp and Check all the Climbing Equipment and rest. Climb 3 Peaks - Everest Base Camp/Island Peak 6186 M/Lobuje Peak 6119, AmaDablam 6812 M.
Day 01 : Pick up from Airport and Transfer Hotel & Rest. Day 02 : 10 AM Meet Guide and preparation Evening Free. Day 03 : Fly Lukla 35 Minute and Trek 5 Hours to Phakding . Day 04 : 5 Hours Trek to Namche. Day 08 : Arrive Chukhung,2pm briefing check equipment, AMS lecture. Day 09 : Acclimatization and instructional day Camp. Day 10 : Acclimatization and instructional day Camp. Day 12 : Summit day depart Base Camp 2 a.m. return lunch. Camp Base camp. Day 13 : provides a second opportunity to summit Island peak due to bad weather or illness. Day 14 :Trek 8 Hours to Lobuje. Day 15 :Trek 8 Hours to EVEREST BASE CAMP and back Gorakshape. Day 16 : Visit Kala Pathar and Back to Lobuche. 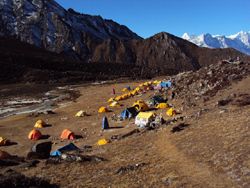 Day 17 : Lobuje Peak Base Camp/High Camp. Day 18 : Summit Lobuje Peak 6119 M and Back to Pheriche/Pangboche. Day 20 : AmaDablam Base Camp. Day 36 : Trek to Tengboshe. Day 38 : Lukla . Day 39 : Flight to Kathmandu.